WASHINGTON — Advocates calling for new safety standards on millions of tractor trailers staged a dramatic crash test in Washington, D.C. on Tuesday, as Congress considers a bill that would make the proposed changes law. 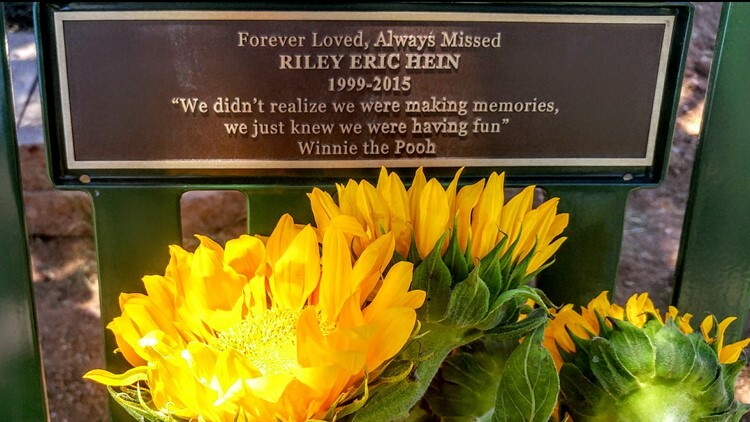 "This is entirely preventable," said Eric Hein, whose 16-year-old son Riley was killed in an accident on a New Mexico interstate in 2015. "Cars will have accidents with semi-trailers, but they do not have to go underneath the semi-trailer and get decapitated, burned or crushed. That does not need to happen." The crash tests were conducted in the parking lot of Audi Field in Southwest, D.C. and demonstrated the effect a side guard can have when a passenger vehicle collides with the side of a trailer. In separate crash tests, side guards developed by two manufacturers, one dubbed the angel wing by a company called AirFlow Deflector, another developed by Accident Research Specialists, are expected to successfully prevent what’s known as vehicle underride. "When you see it in person, when you are standing waiting for it, and you hear the crash, there's vibration. You know the sounds, and you see it with your own eyes, you don't forget," said Marriane Karth, who helped organize Tuesday’s crash tests. In 2013, Karth lost two daughters, 17-year-old Anna Leah Karth and her 13-year-old sister Mary in an underride accident while driving in Georgia. Underride happens when a car slides under a semi-trailer during an accident, often killing and even decapitating the passengers inside the vehicle. Because of the violent nature of the crashes, safety features like airbags are often completely ineffective in underride accidents. WUSA9 has been reporting on underride accidents since 2017, when Karth and another mother, Lois Durso, began lobbying Congress to pass new laws requiring stronger protections for motorists. Sign Petition: End Deadly Truck Underride Crashes Now! Hundreds of people die every year when pedestrians, cyclists, motorcyclists, and passenger vehicles go underneath trucks. Over 4,000 have died during the past 19 years since the last underride regulation was issued in 1998. Families of victims and safety advocates are calling for an end to preventable truck underride tragedies. Durso’s daughter Roya died in an underride accident in Indiana in 2004. "You never get over the loss of a child and every single time we see another crash that produces a fatality and it didn’t have to happen, it just compounds the pain in our heart," Durso said. After WUSA9’s series of underride reports and relentless pressure from Karth and Durso, U.S. Senators Kirsten Gillibrand, D-N.Y., and Marco Rubio, R-Fla., and U.S. 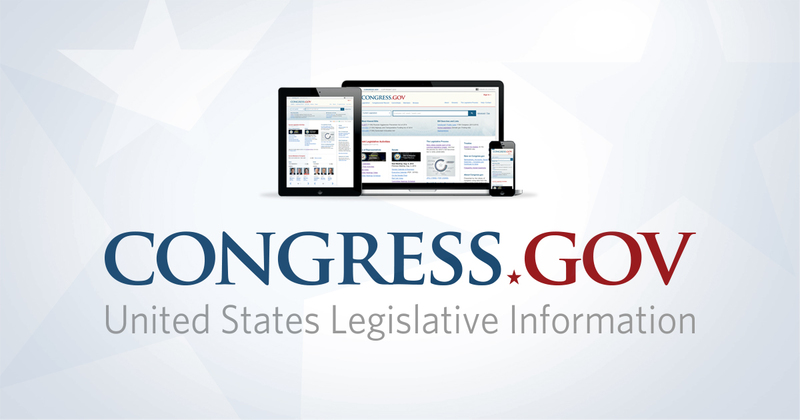 Representatives Steve Cohen, D-Tenn.-9, and Mark DeSaulnier, D-Calif.-11, introduced bipartisan legislation, the Stop Underrides Act, to help prevent deadly truck underride crashes. The bill would help prevent those types of deadly truck crashes by requiring what’s known as underride guards on the sides and front of semi’s and would update standards for underride guards on the back of trucks. Those rear underride guards are required on tractor trailers, but WUSA9’s investigation revealed the current standards don’t withstand the force that they are required to, resulting in even more deaths. While the numbers are not specifically tracked by federal crash data, safety groups estimate hundreds die every year in preventable underride accidents. The Department of Transportation first considered requiring side guards 50 years ago. A federal register stated the DOT anticipated supporting a law requiring side guards on semi-trailers as far back as 1969. So why hasn't the Department of Transportation's regulatory arm, the National Highway Traffic Safety Administration, moved forward? One NHTSA memo from 1991 stated, "...side underride countermeasures have been determined not to be cost-effective." But the agency didn't give any details of how they came to that decision. WUSA9 couldn't find any other NHTSA statements on the issue. The agency has not granted WUSA9's repeated requests for an interview. The trucking industry opposes the tougher underride guard standards and requirements. 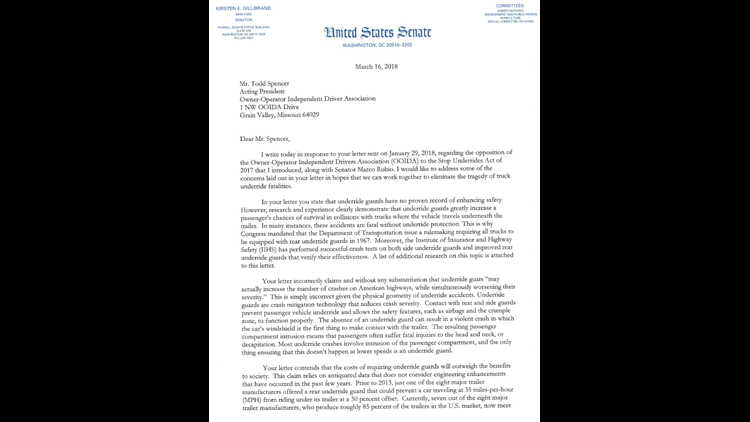 In a letter to Gillibrand, the Owner Operated Independent Drivers Association (OOIDA) said the requirements cannot be accommodated on most trucking equipment and would yield little if any safety benefit, while costing truckers billions to comply. Manufacturers of the side guards tested Tuesday estimate the devices would cost about $2,500 per trailer. "There is no assurance that such installations would result in fewer or less severe crashes involving heavy vehicles," OOIDA President Todd Spencer said in a release posted to the organizations website.